Scott Kelly has returned to planet Earth after spending 340 days in space with no significant problems—a milestone for the future of deep space travel and the goal of sending humans to Mars. Kelly and fellow cosmonaut, Russian Mikhail Kornienko, landed in Kazakhstan on March 1, 11:26 p.m. EST (10:26 a.m. March 2 local time). Expedition 46 Commander Kelly, who had previously spent 159 days aboard the International Space Station, sets NASA’s record for cumulative days in space. “It felt like I’d lived there forever,” said Kelly, in an upbeat manner, during a NASA TV release of a press conference at NASA’s Johnson Space Center on March 4. Kelly did admit suffering some physical afflictions after returning home. Among his symptoms are muscle soreness and fatigue, and sensitivity to touch due to having not touched anything rub on his skin for a long time. It makes you more of an environmentalist after spending so much time looking down at our planet. Part of Kelly’s mission was to see if it is possible for a man to spend a significant amount of time in space to achieve the goal of sending a manned mission to Mars. NASA initiated its Human Research Program with Kelly and his identical twin brother Mark, a fellow astronaut. 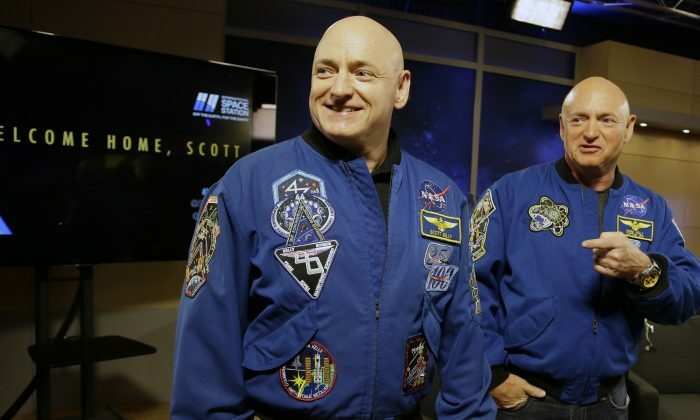 Mark Kelly remained on Earth, living his day-to-day life in Arizona, while his brother was in Space so NASA can compare the two men. The various tests have included blood sampling at regular intervals before, during, and now after the one-year space mission. So far, according to Kelly, they have found nothing significant other than Kelly having had a temporary two inch growth spurt whilst in space caused by an expansion of the vertebrae. Other changes Kelly noticed being back on Earth is a difficulty judging distances with objects. “First thing I tried to throw on a table I missed. I tried to shoot some basketballs yesterday and I didn’t get any of them in the net—not that I’m a good basketball player in general anyway,” Kelly quipped. “I don’t think it’s really hit me yet,” said Kelly. Dr. John Holden, policy director of the White House Office of Science and Technology, also spoke upon Kelly’s arrival at the importance of mission. “It’s gonna help us figure out how to deal with those physiological changes on the even longer missions that are ahead when we go to Mars, and we are gonna go to Mars, there is no doubt about that, we are committed to it,” Holden said.